Looks delicious Charlotte! Please share the name of the Lutheran Church Cookbook. I will put it on my "internet cookbook hunt" list. 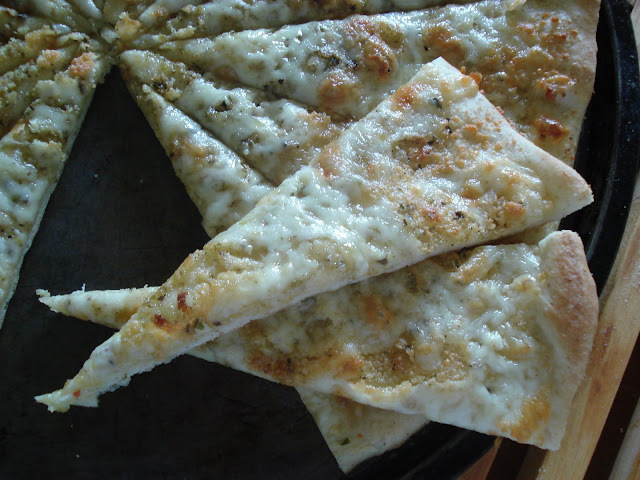 My friend from NJ calls this "white pizza"
I love that! I make a lot of homemade pizzas but this would be something different...without so many toppings! I'll try it! Thank you for that quote -- very applicable to my life just now. Can you bring these for lunch on Monday? This sounds very good Charlotte. Heather L- when ever we play the "what if" game we ALWAYS come out the loser. There is no truth in the what if, and I have learned from experience that the "what is" is never as scary as "what if", because God is there every step of the way and he can't be in it when it is simply our fear. yummy! it will be made next week at my house! Oh...this looks so yummy...I can almost taste it. I am going to try this one...for sure! I love anything that has a Mediterranean/Italian flavor. Guess what my appetizer will be for Father's Day???? This was a keeper. My family finished off the whole pan before any meal even started. I added one thing...I drizzled herbs from my garden to give it that extra Schmeck. Tried it just with salt&olive oil and fresh Basil from my garden as topping and served it with Ratatouille! A great success! Thank you! Last night, just an hour and a half before company was to arrive for dinner, I suddenly thought of adding this bread to the menu. It was so quick and easy to make and it turned out to be a huge hit! I used "Greek with Feta and Oregano" dressing, otherwise I followed the recipe exactly. Mine turned out quite thick, so I assume you used a pan larger than my 12 inch. Thick or thin, this is extremely tasty and I will definitely make it again! I made this for our Christmas family gathering yesterday. We had a huge meal for lunch and then appetizers for supper. This was a big hit, especially with the kids. The dough makes more than enough for my large pizza stone. I just made this for lunch today and it was very good! I like a bit more garlic flavor though so I added a bit more. The only thing I could critique is that the cooking temp seemed a bit high for the amount of time it was supposed to be in the oven, so I kept the oven at 400 and it came out perfect.